If we made a list of the easiest things to do with PDF documents, then “how to combine PDFs (Mac)” would probably be somewhere near the top of that list. Interestingly, however, a surprising number of users find the prospect of merging PDF documents falling somewhere between “I’m Scared I’ll Screw It Up” and “Are You Kidding Me?? ?” The process of how to combine PDF files on Mac is actually very simple once you know what you need to do. What are the Different Ways to Combine PDF (Mac)? Essentially, the two types of PDF joining or merging tools are online and offline. The online method uses a web-based interface where the combining of files is done on a remote server. The problems with this are obvious: security and privacy risks, no standard for quality, mostly limited to 100MB for the combined output and limited features on most online PDF merging services. The offline method uses standalone or shared software and offers a much more secure environment, which is crucial for combining confidential documents containing sensitive information. There is also no limit on file size, and the quality of a merged PDF using a standard and reputed software can be relied upon. The process itself is simple and is the opposite of splitting a single PDF into two or more files. Just as the splitting process gives you options to simply split the file into two or extract specific pages to a new file, the PDF combining process allows you to completely merge two files or choose the pages that are to be merged. It depends on the features of the software or tool you intend to use, which brings us to the main part of this article. 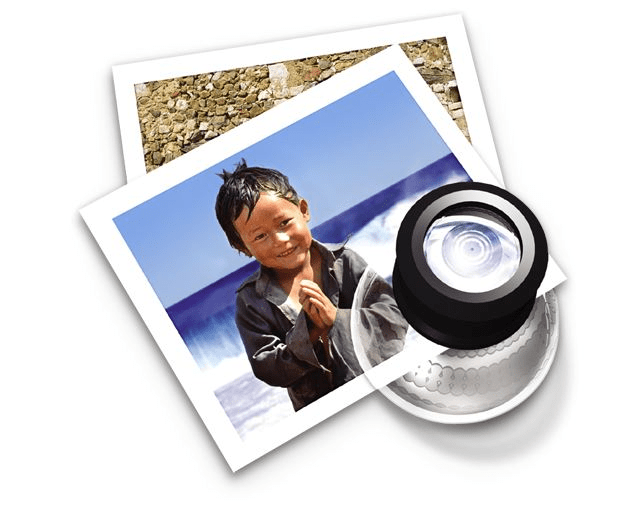 The Preview app in Mac can be used for a lot more than just viewing images, graphics or PDF files. It can also be used to manipulate these files in a number of ways. One of these features is the ability to combine PDF docs. In Mac Preview combine PDF as a feature is actually very simple to use, although you might not want to use it for very large files because it can slow down your Mac. Launch the Preview app on your Mac and open the first PDF file using the File menu. Enable Thumbnail view by going to View in the top menu and selecting Thumbnails. You should now be able to see the pages in the left sidebar. Next, go to Finder, drag the second PDF and toggle back to Preview, where you can drop it in the Thumbnail area at the top, in between or below the pages of the first document. The drag and drop method can also be used with both files open, as shown in the screenshot below. To choose non-adjacent pages, just use the Cmd+Select option to choose the required pages. Another way to insert a different file is to go to Edit > Insert > Insert pages from file… If you use this method, make sure you have selected the page afterwhich you want the new pages inserted. Of course, you can move them around once they’re in so it doesn’t really matter. Now save the merged document with a different name, and you’re good to go. And that’s all there is to it, really. If you want to preserve the first document as it is, then it’s better to first create a copy with a new name and then merge it with the second document. That way you keep the original document as it is, just in case you need it later on. Not many Mac users are aware of the Preview app’s ability to handle PDF documents. Sure, there’s no way to edit a PDF using Preview, but it does allow you to annotate documents, which is very useful when you’re merely reviewing and commenting on a document rather than editing it. One of the great features is the Markup Toolbar. Clicking on the toolbox icon brings this up, and this is where you’ll find all your annotation tools like highlighting, striking through, underlining, adding boxes with text and so on. For users who only need to read and annotate documents at scale, this utility serves the purpose very well. You can also use it to fill out PDF forms. Sadly, Apple hasn’t focused much on this product. Yes, it does get enhancements, and is currently on its Mojave version, but there’s very little promotion around it. Did you know that you can open as many as 31 different file types with the Preview app? Kind of like Baskin-Robbins with its 31-derful flavors! You can also add keywords to images and PDFs. They subsequently get indexed to Spotlight so you can find them easily anytime you want. Even though Apple doesn’t promote it that way, this is one of the most comprehensive amateur PDF utilities around for Mac. Unless you’re doing text editing or some of the finer things, Preview can pretty much handle most other actions on PDF files. This utility is one of the top rival PDF editors to Adobe Acrobat Pro DC, and is available at a much more affordable price than its more popular counterpart. The name may be new to you, but the company behind it, Wondershare, has developed a diverse range of applications for desktops, iOS and Android devices. 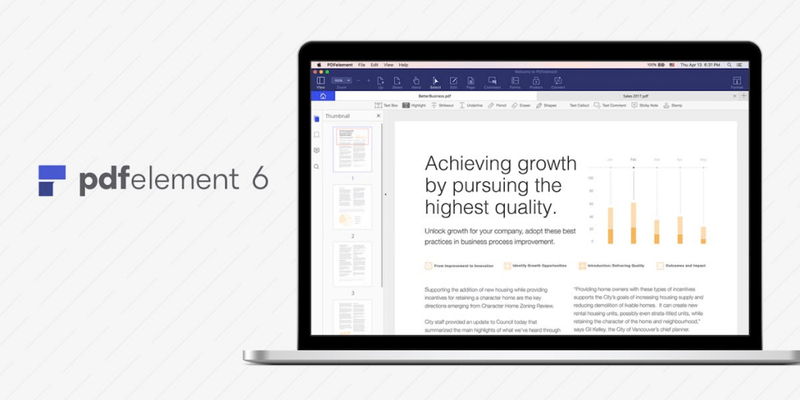 PDFelement Pro 6 for Mac is their latest iteration of PDF editing software, and it comes with an impressive list of features suited to every type of business from one-woman-shows to multinational corporations. 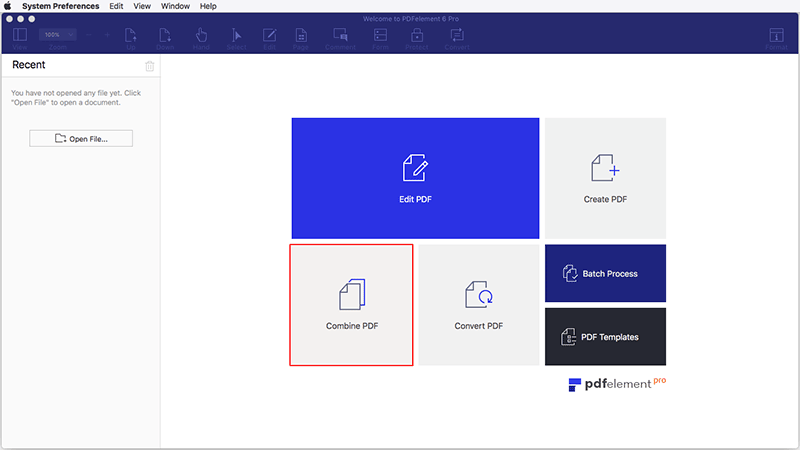 PDFelement for Mac is also available as a Standard edition, and if you only want to combine PDF files in Mac, this should be more than adequate. Open PDFelement and click on Combine PDF in the main window. Click on Add Files to import your PDF documents. You can re-order them at this point. On the right panel, click Combine. Once the process is complete, you will be prompted to name the file and save it. After saving, the combined file will automatically open up. You can then reorder the pages, delete them and much more. You can also merge files by first opening one file, then dragging and dropping the second file from Finder into the thumbnails panel, which you can activate using the View icon on the top left of the software window. Although this method is easier, if you’re working with very large PDF documents containing dozens or hundreds of pages, it’s better to combine them into a new file and then do your reordering and edits that way. Doing this will allow you to retain both the original documents and only work with the combined one. The drag and drop method will mean changing the first file. If you accidentally save it without changing the name, your original file will be gone. Although the process is simple enough, PDFelement can be used for a whole lot more than just combining PDFs or individual pages of PDF documents. You can also convert scanned PDFs into an editable format using OCR (optical character recognition – Pro version) and then combine that with another PDF document. In addition, you can take a bunch of images and convert them into a single PDF document where you can rotate and do other things with the images. Even as a solution for combining PDF files or pages, it is one of the most robust applications we’ve seen for handling PDFs, and a fitting rival to Adobe Acrobat, Nitro PDF and other top-tier applications in this category. In addition, the software has a robust suite of PDF editing tools, as well as other features like creation, conversion, form filling and extraction from scanned documents, security, signing and more. 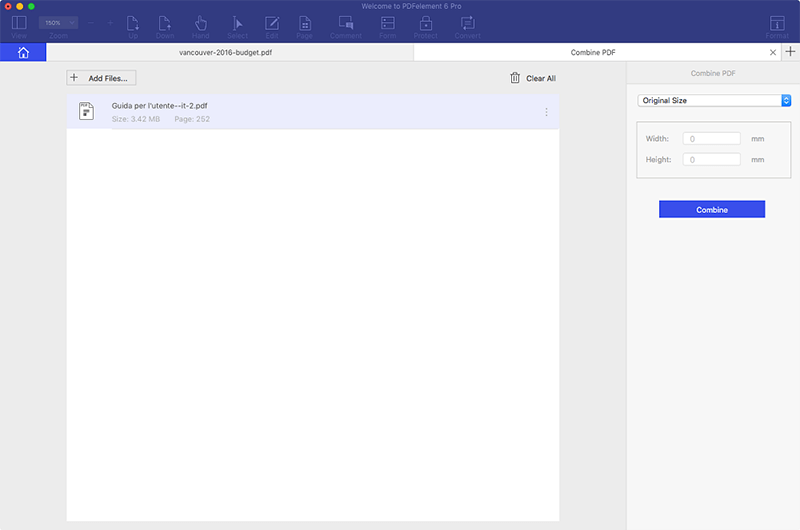 From a user interface (UI) perspective, the new look of PDFelement 6 has a clean and uncluttered layout, unlike what you might see in Adobe Acrobat Pro. The software offers multiple ways to do most actions, as we saw with combining PDFs. If you’re more comfortable navigating the features through the main menu, you can do that. In regards to UX, or user experience, you’ll find PDFelement to be very intuitive. Instead of putting all the tools in plain sight, you’ll see custom toolbars popping in from the right side when you select a particular action or an element within a PDF. It makes for an undistracted environment when working with specific elements. There is also a full-fledged online help section that you can access from Help > User Guides. If you’re unfamiliar with a particular function or process, you can just head over there and check the corresponding guide to help you through it. Yet another versatile tool for combining PDFs and doing a lot more is PDF Expert. 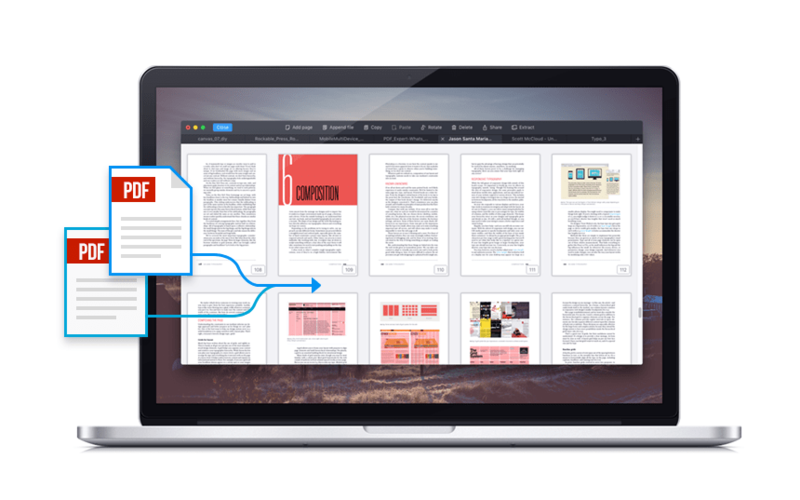 Expressly designed for Mac, with versions for iPhone and iPad, this dedicated PDF utility has everything you need to handle PDF documents. Right out of the gate you’ll be able to see that this application was designed for ease-of-use. Very unlike the cumbersome Adobe equivalent, it makes viewing thumbnails a pleasure rather than a nightmare for scroll-o-phobic fingers. Since the application is specially designed for the macOS and iOS platforms, it ‘plays nice’ with all iDevices, leveraging the full capability of superior screen technology combined with the intuitive controls that Mac apps usually boast. Select the two files to be merged, and click on the Merge button. The drag and drop method can be used here as well. For this, open the first PDF and enable thumbnail view from the main toolbar. As mentioned, the thumbnail view here is much better, allowing you to easily see them in a grid rather than single pages that you have to scroll through. Now open a Finder window, select the second PDF file, toggle to PDF Expert, drag it into the thumbnail grid and drop it where you need to. PDF Expert has garnered a lot of praise over the years. It was chosen to be the top Mac app of the year as well as the No.1 paid app in the Mac App Store. It boasts the entire suite of PDF tools that include creating, editing, annotating, form-filling, signing and merging. You can also export your annotations when converting PDF into other formats like MS Word or PowerPoint, and it offers Touch Bar support for newer MacBook Pro models. 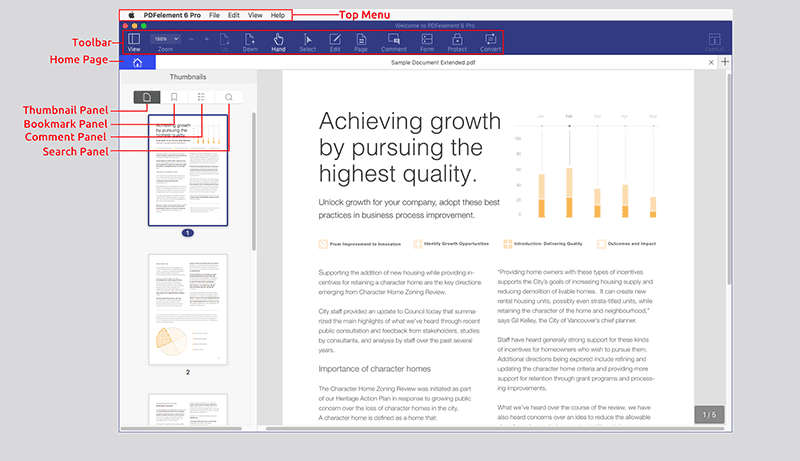 PDF Expert also offers a unique split view mode that lets you compare documents side by side, which is very useful when you’re comparing two versions of a contract, or two versions of a recently altered document. The only real downside here is the glaring lack of a Windows version. Considering that most of the world’s businesses operate in a Windows environment, it’s a little strange that the company hasn’t developed one yet. 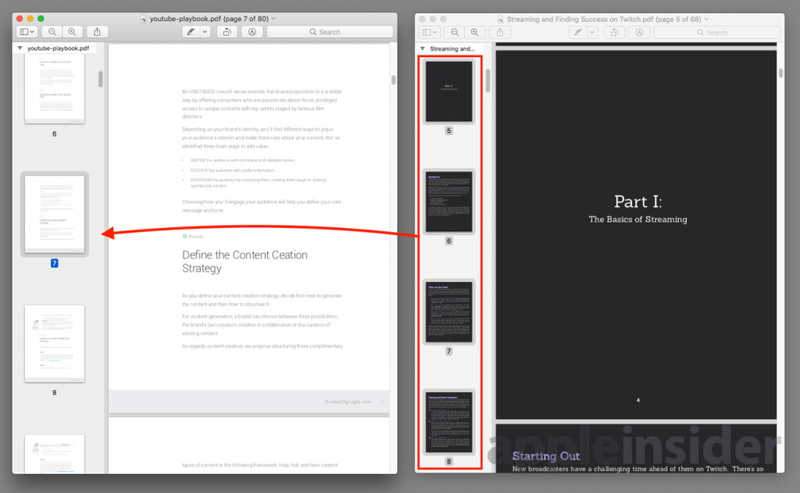 But then again, Nitro PDF completely leaves Mac out of the picture unless you’re okay with dual-booting your Mac with Windows 10, so there you have it. All of these tools are equally capable when you want to combine PDFs in Mac. The choice actually depends on what you want to do with the document after you have merged the individual files. If you need a robust editing tool with conversion, security, signing and other advanced features, PDFelement works best. For a Mac-friendly tool that gets the job done, PDF Expert is recommended. If you’re not editing anything, but simply merging and manipulating pages, then the Preview app is more than adequate.